Very Positive (124) - 83% of the 124 user reviews for this game are positive. 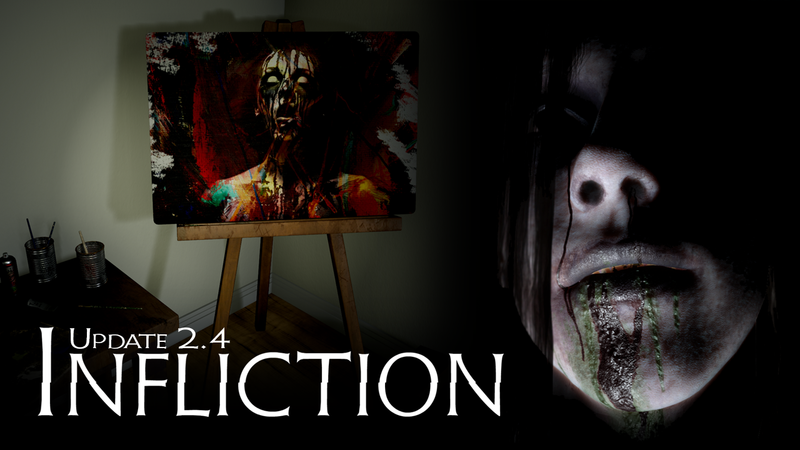 I’m happy to announce Infliction update 2.4. This update adds Spanish subtitles and UI as well as unlockable bonus content, changes, improvements and fixes. I’ve heard folks say the paintings in the game are interesting. I thought I’d set the bonus content in the Tall Pines art gallery showing most of the art work off. Enjoy! Added bonus content: videos, images, deleted sequences, un-used placeholder character models and more. Thank you so much for your continued support and enjoy. 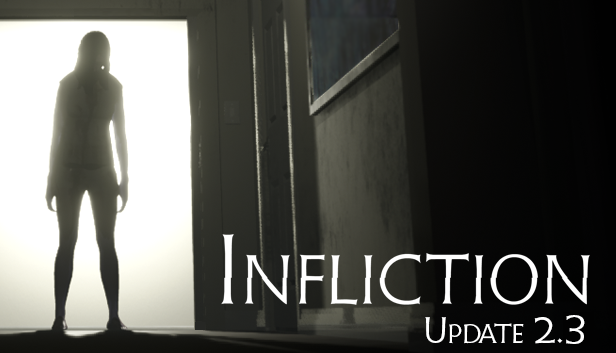 I’m happy to announce Infliction update 2.3. This update adds Russian, French and Japanese subtitles and UI as well as some small additions, changes, improvements and fixes based on community feedback. Apologies for the slight delay of this update, it turned out to be larger than I expected. Thank you so much for your continued support. I will add more languages over time so keep an eye out in future. Thanks everyone and I hope you enjoy the update. *Edit* Hot-fix 2.3.1 addresses a glitch introduced in 2.3 where checkpoints were not saving. This has been patched out. Sorry for the inconvenience. A restless AI enemy will be stalking you, and you really don’t want to be caught. Will you hide, or find some way to fight back? Standard difficulty will occasionally point you in the right direction, but in hard mode you will be on your own. depictions of violence, physical abuse, drug abuse, alcohol abuse, and self-harm. © 2018 Developed by Caustic Reality. “Caustic Reality” and its logo are trademarks of Caustic Reality. "Infliction" is a trademark of Caustic Reality. All rights reserved. Unless otherwise indicated, "Infliction" game is copyrighted by Caustic Reality. No part of the game may be used for any purpose other than intended. Therefore, reproduction, modification, storage in a retrieval system or re-transmission, in any form or by any means, electronic, mechanical or otherwise, is strictly prohibited without prior written permission.